More of my photo wall. One of my favourite illustrators is Madrid-based Blanca Gómez, whose website is called Cosas mínimas (Spanish for "Tiny things"). The site has a gallery of her illustrations, past and present projects, and links to her flickr and etsy store. The Blanca Gomez prints that I have are from the Bakers Dozen project, an online store curated by Aussie illustrator Amy Borrell. As the store's site says, "Bakers Dozen is a small happy silly online shop. 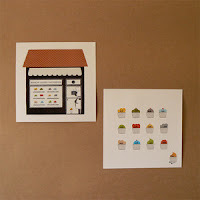 13 wonderful artists/makers were asked to create an object in a limited edition of 13..."
I have this cupcake diptych (what a wanky word for pair) on the wall in my kitchen.